A white, stunning smile rarely happens by accident. When you see gorgeous smiles on the covers of magazines and on the screen, many of those celebrities have underdone cosmetic dentistry. One option to transform your smile is by getting porcelain veneers. They are the secret behind many Hollywood grins. You do not need to live in California to achieve a stunning smile. We can give you a smile makeover with veneers, right here in Georgia at Dental Care Center at Kennestone. Porcelain veneers offer a quick, lasting solution to change the appearance of your smile. Using thin porcelain dental shells, our cosmetic dentist can change the look of your teeth. Veneers are customized to fit your teeth and create a new exterior that you show to the world. Our cosmetic dentist can use veneers to hide gaps, crooked teeth, discolorations and many other dental flaws. 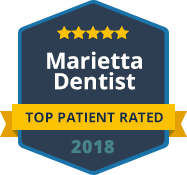 In just a few visits to our office in Marietta, you can have a complete smile makeover that you will love. To perform a smile makeover with cosmetic dental veneers, we first need to determine the look of your new smile. 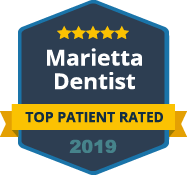 During your first visit, you and our cosmetic dentist will discuss what dental flaws you want to hide and decide on the look of your new smile. To create the dental veneers, impressions are taken of your teeth and are combined with the design for your new smile. The porcelain shells are made in a dental lab. Your teeth are prepared for the veneers by removing a tiny amount of enamel to leave room for your new porcelain exteriors. On your final visit, the veneers are bonded to your teeth, and you will leave our office with a new smile. Porcelain veneers can give you a new smile in less than two weeks and can last for many years. If you are interested in a smile makeover, contact Dental Care Center at Kennestone to schedule your cosmetic dental consultation.